Erin graduated from the University of Nebraska-Omaha with a degree in Library Science and an English minor. 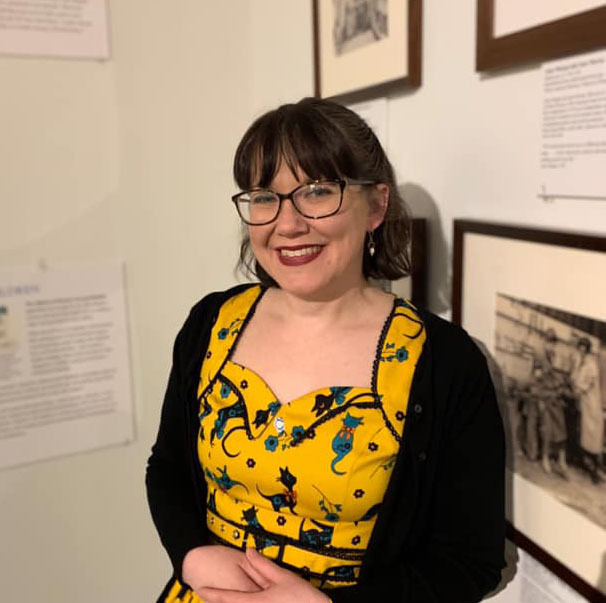 Erin first became involved with the KANEKO-UNO library when she worked as a student worker, and she is excited to now be in the library as the full-time manager. What Erin most enjoys about libraries and KANEKO is being a part of the creative process. Imagination and creativity are facilitated by discovery, and Erin loves to help people of all ages and backgrounds explore their creativity through research and exposure to new and different perspectives. The K-UNO library has a very unique collection focused on creative approaches to a wide variety of subjects, and Erin works hard to keep the collection fresh and vibrant for her patrons. When she is not working in the library, Erin is working on completing a Master’s degree in Language Teaching. While work and school do keep her very busy, she can always find time to build a LEGO set, play with her cats, or curl up with a good book or movie. Make sure to stop in the library and say hi to Erin and her friendly staff, and check out our unique collection!